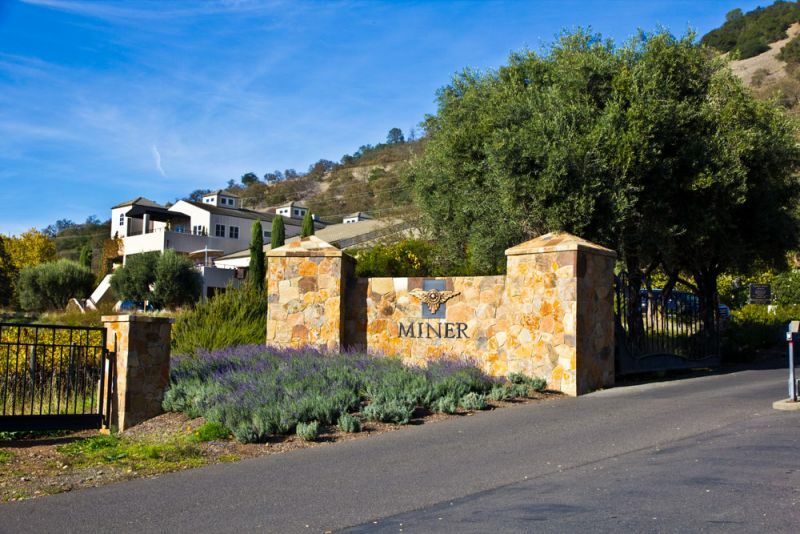 The Artist and I visited Miner Family Winery while California Girl was enjoying her European Grand Tour. 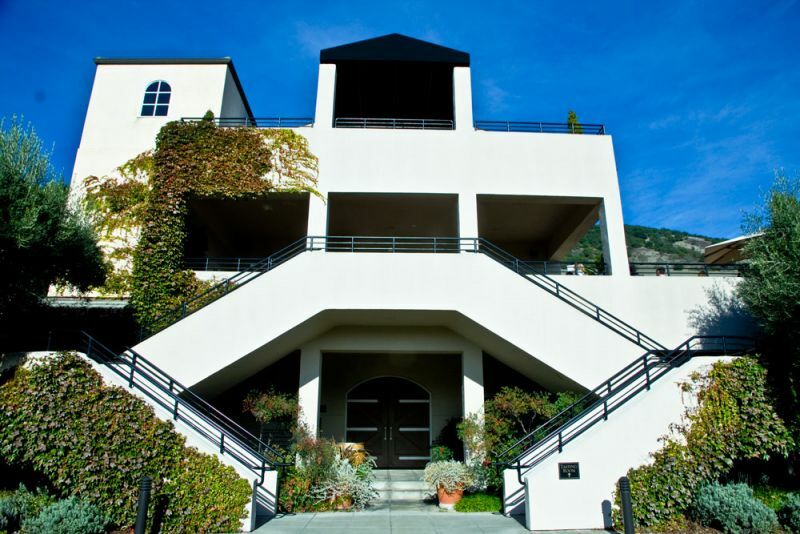 We visited their Wine Bar Tasting which sits on the third floor of a building on the slopes above Silverado Trail. There is a balcony with great views over the valley, but when we visited their was no free seating, so we tasted at the bar. 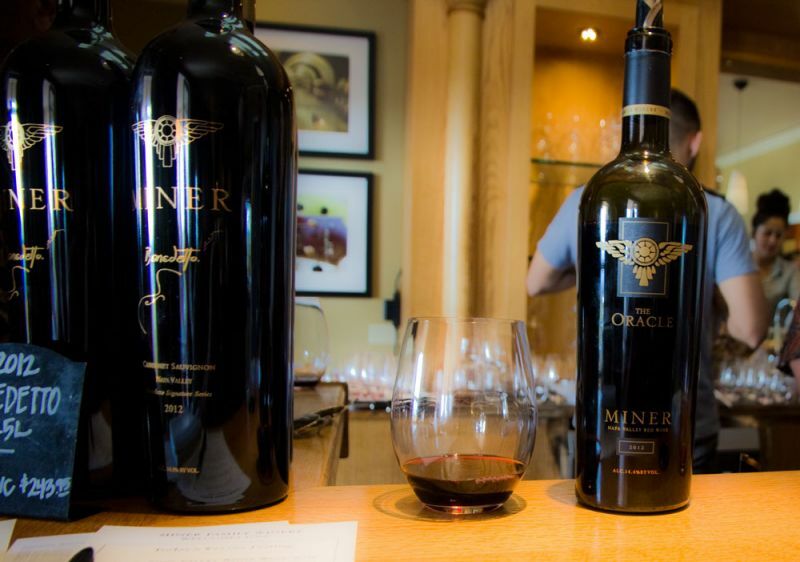 The tasting costs at Miner Family Wines is $25 for six tastes, although we sampled a couple of additional wines. The tasting fee is waived on the purchase of $75 of wine. Each wine was poured into a fresh glass and the style of glass was matched to the wine. All of the glasses were stemless, which presumably makes dishwasher loading easier than would be the case with regular wine glasses. The downside is that the wider bowls, used for Chardonnay and Pinot were quite difficult to hold and needed two hands to do so. The glasses were made by Reidel and had the Miner Family name and crest engraved on the base. Having clean glasses, whilst adding to the amount of work required by the staff, does help ensure that each new wine is fully experienced. 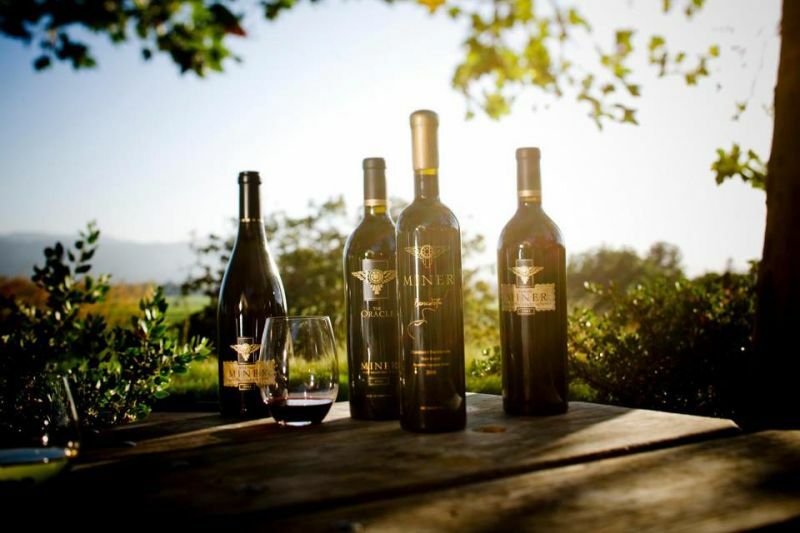 The first wine we tried was the 2012 Napa Valley Illiad; it sells at $30. 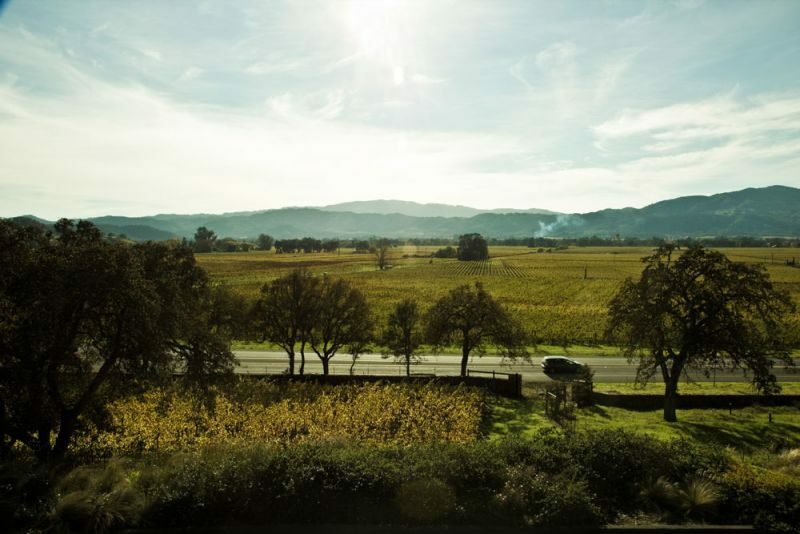 It is a white wine Rhône style blend of Marsanne, Roussanne, and Viognier. The nose was a heady mix of honey and floral notes. Taking a sip, I tasted a slightly sweet, creamy wine with low to medium acidity. A second sip allowed me to taste almonds and hints of apple. This is not a style of wine of which I am especially keen; too floral and whilst not a sweet wine, it was sweeter than I like. I do think this was a good execution of the style and know plenty of people who would love this wine as a summer afternoon sip. The next wine was the 2013 Wild Yeast Chardonnay, which sells for $50. The name references the fact that no yeast is added to the wine; the fermentation occurs with just the natural yeast on the grapes and in the air. Until the middle of the nineteenth century when whoever discovered that alcohol in wine was a result of yeast reacting with sugar, this is how all wines were made. The nose was of vanilla and over-ripe peach. The flavour was of vanilla, butter, and mustard seed. 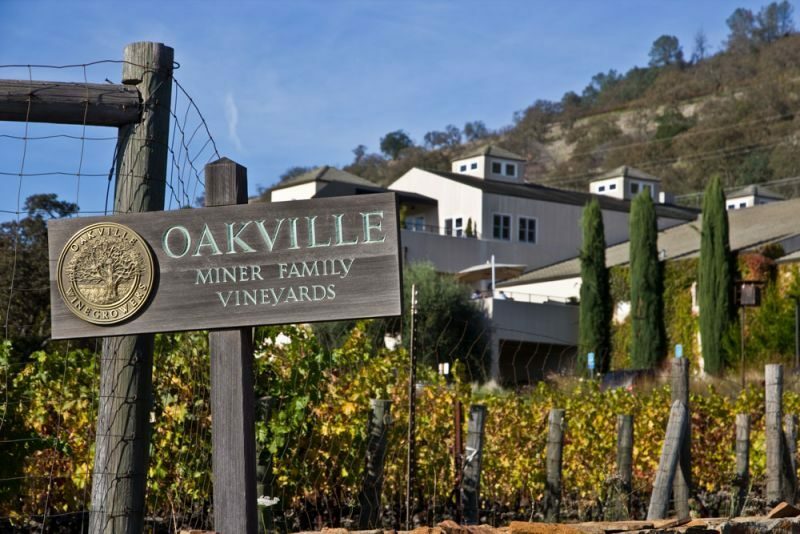 The texture and flavour of the wine made me assume that this wine had spent time in oak and undergone malolactic fermentation; an assumption that I was able to verify with the excellent and detailed data sheets that Miner Family Winery have on their website. The third wine was a Pinot Noir from Garys’ Vineyard in the St Lucia Highlands. This sells at $60. The wine’s colour was pale, almost pink. The nose was a mix of floral notes and raspberry. The wine’s acidity was medium to high with distinct fruitiness of strawberry and plums. I would find this wine to be extremely easy to drink, but at this price I would prefer something more complex. The aforementioned data sheets do illustrate one of the challenges of tasting wine. My notes show that my palate found the third one to be notably more acidic than the first, but looking at the information on the website I can see that the pH for the wines are 3.55 and 3.52 respectively. I was right in finding the Pinot to be more acidic than the Iliad, but only marginally. The fourth wine was not on the tasting menu, but was open and out host, Angie, thought that it would be an interesting comparison. This was the 2013 Pinot Noir from Rosella’s Vineyard ; which is also in the St Lucia Highlands AVA. The hue was darker and the nose with rich notes of plum was a more traditional Pinot Noir aroma. This wine had a higher acidity than the previous wine, The flavour showed the complexity I like in a Pinot; raspberry, strawberry, rich tannins, and a great pepper in the finish. I definitely preferred this Pinot, but had yet to find a wine that excited me, but that was about to change. The next wine was the 20111 Syrah from Stagecoach Vineyard on Atlas Peak in Napa Valley. The nose was intense, with blackcurrant the dominant element. It took me a while before I tasted this wine; I was so busy revealing in the depth of the wine’s aroma. When, at last, I took a sip, the flavour did not disappoint. There was medium acidity, raspberry, tobacco, blackberry, spice, and just a hint of sweetness. This was a wine that I loved; one that called out for being eaten with a hearty stew or a venison steak. The added bonus is that this wine sells for $40. The sixth wine was the 2013 Emily’s Cabernet Sauvignon, which costs $50. 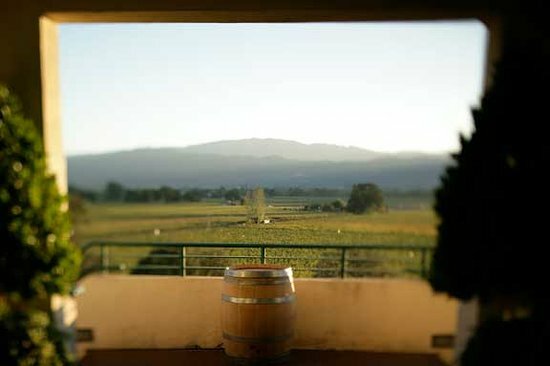 It is a blend of grapes from the valley floor and the mountain side, with 5% Cab Franc added. 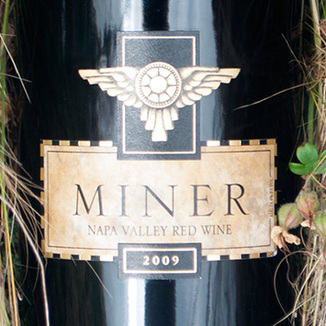 The wine is named for Emily Miner; the co-founder of the vineyard. The colour was ruby red, with a nose of rich dark fruits in which raspberry played lead role. This was a classic Napa cab with a big, long finish. The distinct tannins hinted at an excellent potential for aging. I liked this wine, but I was still more impressed with the Syrah. The last wine on the menu was the 2012 Oracle, a Napa Valley Left Bank Bordeaux style blend: 54% Cabernet Sauvignon, 25% Cabernet Franc, 15% Merlot, 3% Malbec, and 3% Petit Verdot. This was the most expensive wine we tasted at $100. The wine was dark, almost black in colour. The nose was far more restrained than the previous two wines, but had an enticing complexity; I detected raspberry and pine. The taste was rich dark berries, with black tea in the mid-mouth, and powerful tannins. This is definitely a wine that needs age. I did feel that both of the previous two wines represented better value. Having concluded the tasting, I noticed that Miner Family make a Sangoivese. Regular readers of the blog will know how much California Girl loves this varietal; so I felt duty bound to ask if I could taste some. Angie very kindly opened a bottle for us. This was a 2013 wine form Gibson Ranch in Mendocino, which sells for $28. The nose was a delightful mix of tomato and raspberry. In the mouth there was great balance of dryness and acidity, which was complemented by strong fruit flavours of plum and strawberry. Even after the last three bold and heavy wines, the complexity of this wine shone through. After feeling jealous of California Girl’s exploits in the last few weeks, this felt like getting my own back. However, rather than have her just read about this wine, I purchased a couple of bottles so that we can enjoy the wine together. In summary, we tasted some excellent wines and those that I enjoyed less were still interesting expressions of wines, but in a style that did not appeal. 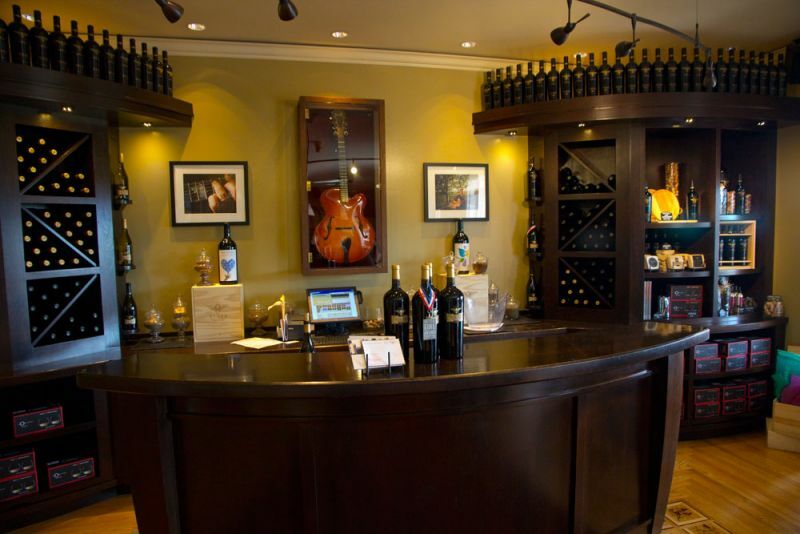 The winery was busy, but the staff were friendly, focused on providing information, and ensuring that no one was left waiting. The only slightly odd omission was the lack of water, crackers, or anything else to help clean our palette between wines. Miner Family Winery has a wide range of wines, most of which we were not able to taste. I think I shall need to return when California Girl is back in town.